Today at the Informatica World, Scott Guthrie, EVP, Cloud + AI, along with Anil Chakravarthy, CEO of Informatica, announced the availability of Informatica Intelligent Cloud Services (IICS) for Azure. Microsoft has partnered with Informatica, a leader in Enterprise Data Management, to help our customers accelerate data warehouse modernization. This service is available as a free preview on Azure today. Informatica provides a discovery-driven approach to data warehouse migration. This approach simplifies the process of identifying and moving data into Azure SQL Data Warehouse (SQL DW), Microsoft’s petabyte scale, fully managed, globally available analytics platform. With the recently released SQL DW Compute Optimized Gen2 tier, you can enjoy 5x performance, 4x concurrency and 5x scale from previous generation. With this release, Informatica Intelligent Cloud Services for Azure can be launched directly from the Azure Portal. You can enjoy a single sign-on experience and don't have to create a separate Informatica account. With Informatica Data Accelerator for Azure, you can discover and load data into SQL DW. Informatica’s discovery-driven approach allows you to work with thousands of tables and columns. You can further enrich your data with Informatica’s Enterprise Data Catalog that provides enterprise wide operationalizing and governing capabilities. You can perform impact analysis, discover data relationships, track lineage and schedule loading among other capabilities. Informatica Intelligent Cloud Services together with Azure simplifies the experience for you to identify and migrate your on-premise data to a modern data warehouse. With this partnership, Microsoft and Informatica accelerate your journey to the cloud enabling you to leverage the scalability and flexibility offered by SQL DW. Create an Azure SQL DW and launch Intelligent Cloud Service for Azure directly from the Azure Portal. To access Informatica products in the Azure Marketplace, see Informatica Intelligent Cloud Services, Informatica Big Data Management, Informatica Enterprise Data Catalog and Informatica Data Quality. 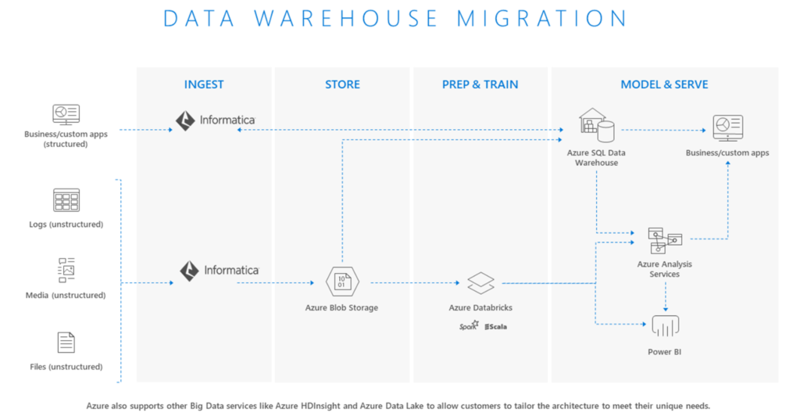 To learn more, download Informatica’s guide for Cloud Data Warehousing for Azure SQL DW. Stay up to date with latest news about SQL Data Warehouse by following us on Twitter @AzureSQLDW.